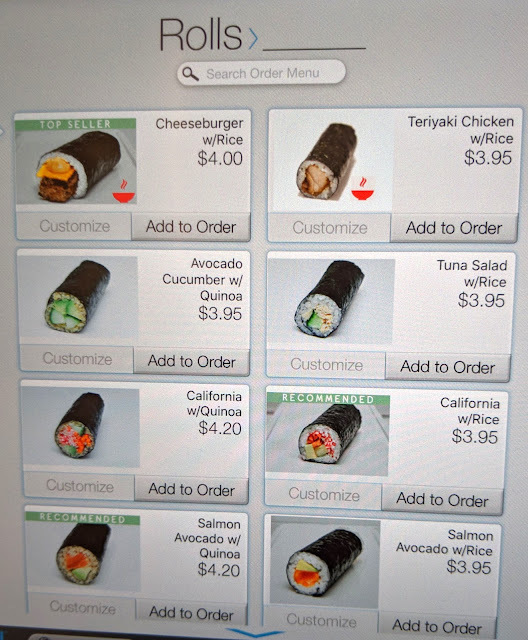 While the cozy shop may be limited in it's square footage, you place your order in a futuristic fashion thanks to touchscreens that display the menu and options. While everything on the menu is gluten-free, nearly the entire menu is also dairy-free (only the cheeseburger roll contains dairy). One thing I appreciated about the menu was that there were veggies options, as well as protein options featuring fresh and cooked meats and seafood. 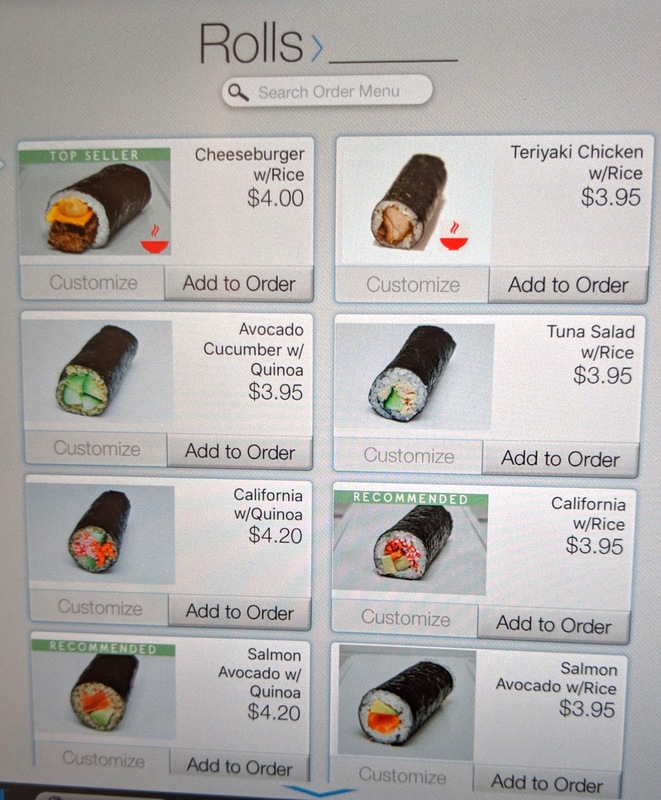 There's something for everyone to love on ROLLN's small but might menu! I ordered two teriyaki chicken rolls, excited by the opportunity to reunite with some of my favorite flavors that I get to enjoy so rarely now that I am gluten-free. I appreciated the large size of the rolls, and they were stuffed to capacity with rice and tender, juicy chicken. The show-stopping component of the roll was ROLLN's homemade teriyaki. 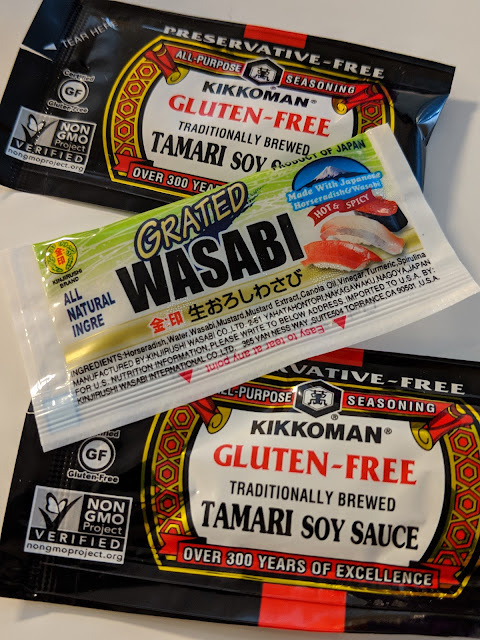 Made with gluten-fare tamari, fresh ginger, and real sugar, the sauce bursts with sweet, savory and umami notes in a bright and delicious medley of flavors. I was in total love with these sushi rolls from my first bite, and was so thankful I ordered two of them! 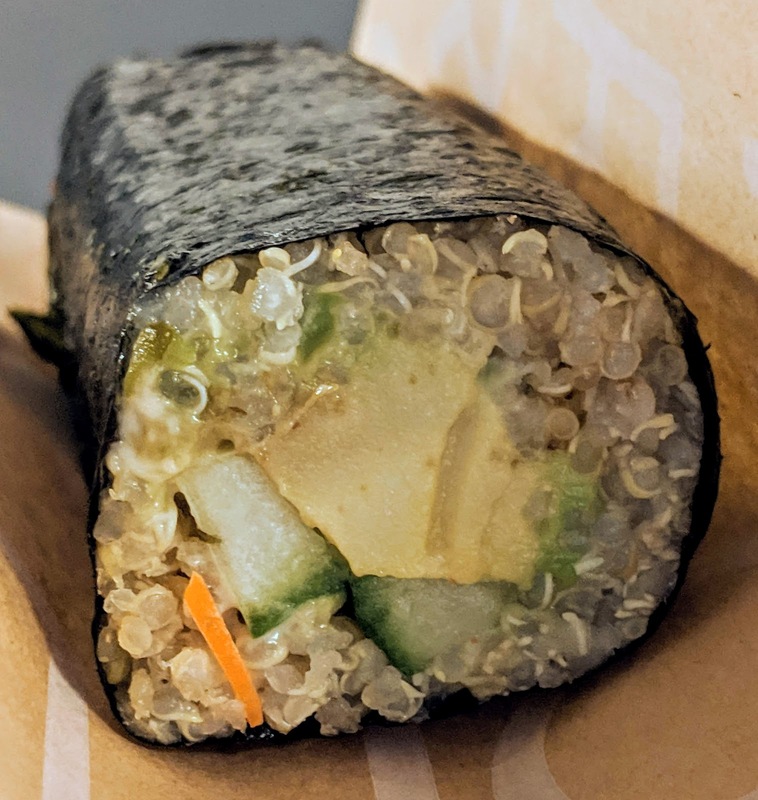 To try out one of their veggie-based sushi rolls, I also ordered one avocado-cucumber roll, which features quinoa as the outer layer of grain and a generous portioning of the namesake veggies with mayo. I loved fresh flavors of the avocado and cucumber and textural contrast of the creamy interior and graininess of the quinoa. Compared to the chicken teriyaki, I appreciated the lightness of this roll, it was filling without being weighty. Apologies for the terrible lighting, my company's office doesn't have the most flattering atmosphere for food photography! 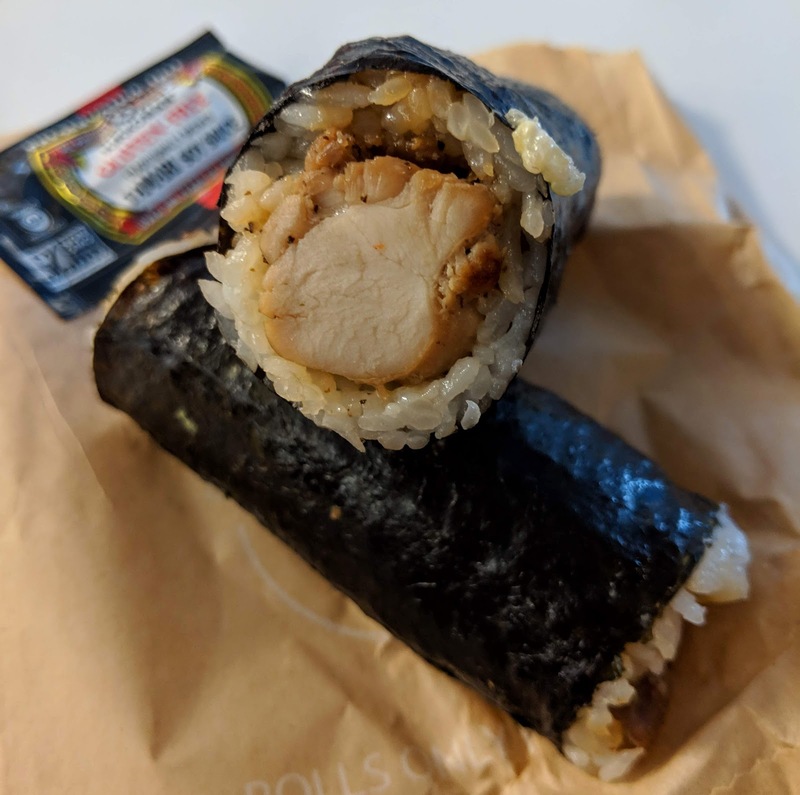 Of course taking sushi to go comes with the traditional accompaniments of packets of soy sauce and wasabi, and here ROLLN has also preserved this aspect of the sushi experience. I enjoyed dipping my rolls in the salty tamari (using a helpful small condiment container they also provide). While a little messy to execute for a lunch at my desk, I was so excited by this new-to-me experience that I didn't mind the dribbling of tamari while pouring it out one bit. Finding places like ROLLN remind me of why I became a gluten-free blogger in the first place, and are an welcome reminder that the world is, and is always becoming a more friendly and accommodating place for gluten-free foodies. 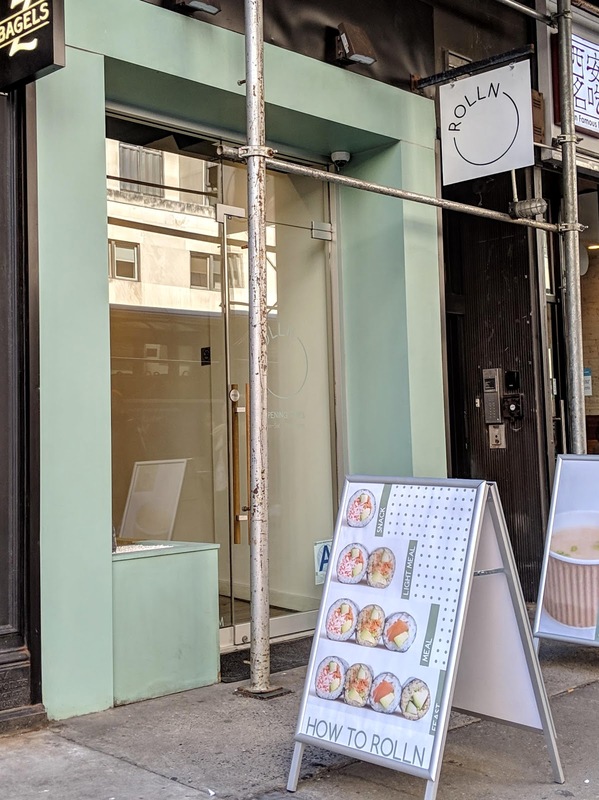 Discovering, enjoying, and sharing my experiences with dedicated restaurants like ROLLN gives me the upmost joy, and I cannot express how much I appreciate their existence and dual commitment to serving gluten-free folks safely and serving up high quality sushi. Not only that, but their staff are super friendly and their menu is not intimidating whatsoever, which made my experience all the more memorable and special. I need to find an excuse to come back to New York soon because I am already anticipating my next ROLLN visit to I can explore more of their sushi offerings and satisfy my cravings for the two rolls I ate in this review!